An arm balance is any posture where the hand or forearm are pressing against the floor to support the weight of the body. As children, the first ones we learned involved crawling (table pose), then we learned to push ourselves up to standing, often falling over along the way (downdog). Later as adults or enthusiastic yoga practitioners, we re-familiarize ourselves with weight-bearing through simpler hand-balances like table and puppy-dog. Once these basic forms of sun salutations (surya namaskara) have been memorized, we can experiment more with vinyasa – flowing on the breath with stability and momentum. Fluid movements through the spine are integral to developing or health in the spine and other joints. Flexibility really needs to be balanced with strength, which is the foundation of vinyasa yoga, and distinguishes it from passive forms of stretching like yin yoga (which are useful as complementary practices). Quality arm balances involve a co-activation of opposing forces around the main joints involved. It’s helpful to study pairs of opposites separately, so they can be re-united, like two long-lost lovers. Note that two of the “pull muscles” also retract the scapula (draw the shoulder blades closer together). They are the rhomboids and the middle trapezius which lies a little closer to the surface. Middle Trapezius: back muscle that spans from the base of the skull across the top of the shoulder blades and attaches to all the neck and thoracic vertebrae. it is divided into thirds, which each portion participating in differing and overlapping actions. The middle trapezius, which lies above the rhomboids, is the section used in pull movements like chaturanga — this is important because we practice it over a hundred times in most flow classes. The upper-trapezius gets a bad reputation for being a “shoulder-shrugger” that stiffens up the neck, however, it participates with other players in a solid handstand. See this blog by a circus performer who is also a physiotherapist for a comprehensive take-down of why it’s a bad idea to “draw the shoulders away from your ears” in overhead positions like downward dog, handstand, etc. 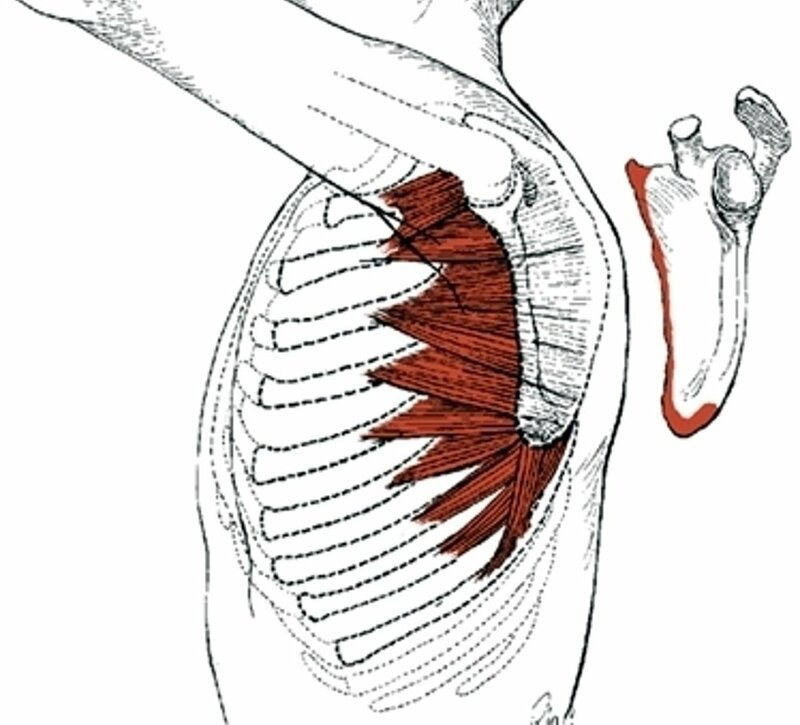 The same muscles used in the push phase of movements also protract the scapula (spread the shoulder blades apart). This why people who bench-press lots of weight have huge pectorals and highly developed serratus anterior muscles, but may have great difficulty in retracting the scapula (drawing the shoulder blades closer together). Full crow has many of the same foundations as high plank. The spine is fully rounded (spinal flexion), which involves a strong chest and abdomen. The first step is protraction of scapula (spreading shoulder blades) is performed by serratus anterior, often called the MVP of shoulder stability. 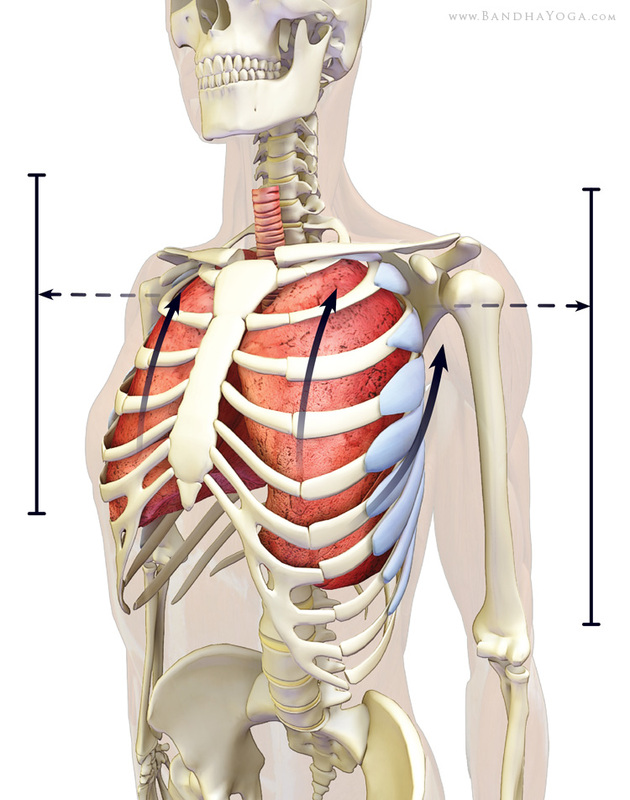 Visualize the general position of this muscle, and see if you can feel a tightening under the armpits. This works very well in seated forward bends like Janusirsasana as well, where you could even press the elbows into the floor if you’re hamstrings are flexible. In positions that involve reach the arms overhead (shoulder flexion) — like downward dog, extended side angle, or ekam in sun salutes — this simply means not going into your full range of motion (backing away from full shoulder flexion). No conversation about the shoulder joint would be complete without mention of the rotator cuff. The rotator cuff is comprised of four muscles that form a “cuff” around the shoulder joint. They contract to keep the head of the arm-bone (humerus) stabilized within the extremely mobile shoulder socket. Two of the rotator cuff muscles are external rotators of the shoulder, another is an abductor (ie: warrior 2) and the last is an internal rotator involved in pulling. Putting the “pull” in your practice results in better quality chaturanga (low plank), a more stable shoulder position that is resistant to injury, and progression towards healthier backbends where the whole spine is involved, rather than only bending from the spine’s more vulnerable areas (lower back). Start training the recruitment of shoulder external rotators (two of which are rotator cuff muscles) by holding a resistance band with both hands, elbows in by the sides of the body… Engage the back of the shoulders and keep the elbows fixed as you try to pull the band apart. Get a sense of broadening across the collarbones. Strengthening the rotator cuff’s external rotators in the overhead range of motion (ie: downdog, handstand). While resistance bands are incredibly useful tools, we can also rest the pull of gravity in positions where the chest faces the floor. We used the puppy dog pose with the palms facing eachother and elbows straight, and then lifted the arm away from the floor. With practice, the muscle memory is trained and you’ll be able to recruit the external rotators along with the middle-trapezius (which was a pull muscle / scapula retractor) in downward dog, full wheel, and…. You guessed it… Handstand. Practice cobra pose in place of upward dog – bend the arms and pull yourself around a slippery floor with a blanket under your hips. Once developed in cobra pose, these pull muscles can be recruited in chaturanga for a more balanced strengthening around the shoulder girdle (rather than front shoulder dominance). With practice we can learn to activate serratus and the pull muscles (scapula retractors) in a way that lifts the entire ribcage away from the pelvis. In puppy dog (and eventually downdog) we can also play with the outer edge of the hand rooting to recruit external rotators (including the rotator cuff). Then try the opposite way, with the index finger knuckle rooting to engage internal rotators (the chest) and lifting the arms further away from the floor (middle-trapezius, a key connection). In Janusirsasana, hold the foot and explore pressing the elbows towards the floor to spread the blades (serratus anterior). Then try the opposite way, lifting the elbows away from the floor to recruit the upper-back muscles that retract the scapula.. In other words, balance the muscles that take the shoulder forwards (flexion / scapula protraction ) with those that lift the shoulder away from the floor (extension / scapula retraction). These co-activations are also used in breathing exercises like Uddiyana Kriya (abdominal vacuum), and even the Nauli Kriya (abdominal roll). Upward rotation of scapula: the shoulder blades also lift up towards ears. A search of Scapulo-humeral rhythm shows why this is crucial in overhead moves. Scapula retraction (subtle): middle-trapezius firing up. Lastly, there is internal rotation of the shoulder (subtle): This happens automatically, no need to focus on it in practice. From a teacher’s perspective, it’s important to acclimatize our perspective and stop adjusting students shoulders when they present this way.